Earlier today we did a major forum upgrade. The most noticeable part for our users may be that the theme looks a bit different. We took our time to test our upgraded theme but possibly some things slipped under our radar. If you spot any problems with the theme, or the forum functions in general, please report them here or contact me directly. Thanks! Lots of bugfixes and improvements under the hood, but no big new features for users. I had to turn off uBlock's font blocking to see the icons. Deleting cookies will delete your sign in information, so that's why you get that screen. Those are caching issues on your end I think. Press Ctrl+F5 to reload the page and it should be fine from then on. That's what I had to do the first time I loaded the upgraded forum. That sounds right. Some of the icons are replaced by glyphs from the webfont "FontAwesome" (font is located on our server) in the new themes. The 2nd image I got during the upgrade of the forum. After that all worked fine. Btw, is it just me or are the icons beside the topic titles more red then before? i block all cookies and allow exceptions in chrome, so i had to first clear all history cookies in chrome then delete .cache/google-chrome and logoff no issues now. Last edited by trytip on Wed Feb 07, 2018 1:15 pm, edited 1 time in total. Correct. I took a pile of screenshots of the old forum so I can readily compare it. This is because the icon (on the right in below screenshots) has been replaced by a glyph from FontAwesome. I could change the colour. Been playing with it for a few hours now and glad to report no errors with anything I have tried. Not a problem. If you use uBlock Origin to block webfonts the Linux Mint forums will still work fine, though where the theme uses glyphs instead of icons you will see a place holder for missing glyph. Doesn't impact the working of the forum so if you want to block all webfonts, without exception, that's fine. uBlock Origin allows you to disable webfont blocking on a per-site basis, should anyone want to enable it for the forums. 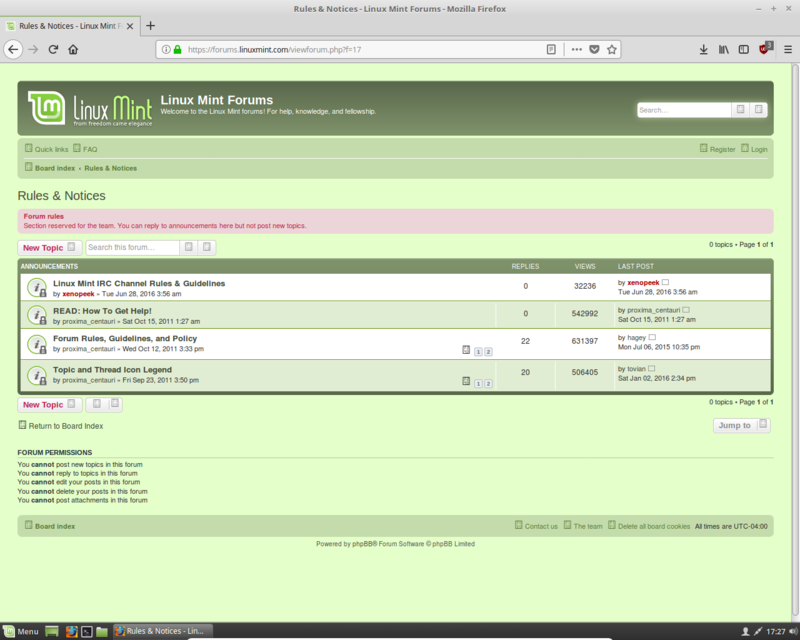 When visiting the Linux Mint forums, click on the uBlock Origin icon and from the panel click on the crossed out A icon to disable webfont blocking for the Linux Mint forums only.